In Maywood, we encountered a customer with a house that was so broken down, it was almost falling apart. Nevertheless, our team eagerly accepted the opportunity to bring this rugged house back to life. We started by gutting almost everything out of the house since the majority of it was unusable. 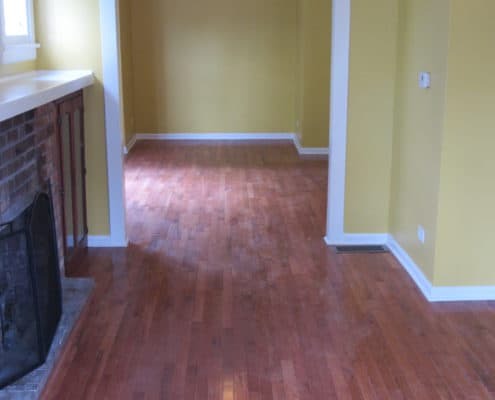 In its place, we installed brand new floors, hardwood and tile, and new windows in every room. We repainted the interior and exterior of the house, as well as added a new front door to replace the rusty old one. Next we built a brand new wooden deck and replaced the broken down garage with a new one. We finished this job up by installing new kitchen cabinets and appliances, as well as completely redoing the bathrooms and basement. All in all, this was a tough and challenging project, but our team exceeded the expectations of our customer. We used Maya Construction to remodel our home we bought in Maywood. We seen them on the Steve Harvey Show and wanted to get a price. They remodeled our whole house even built a new powder room on the first floor. They were reasonable in there price. They did a great job. We are very happy with there work.